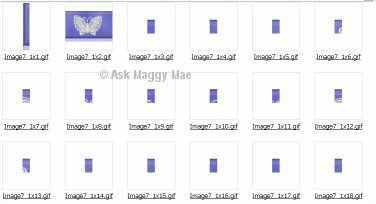 Click on File then Export then choose Image Slicer. I used the Rows and Columns showed in the graphic above as I only needed small portions of the original to create my background graphics. Once I clicked ok it went back to the previous window and my graphic was displayed as shown below. I then used the delete button on the lines I needed to delete in order to get my 9 graphics I needed to complete my background frame.If you look closely at the graphic below you will see that on the top both sides consist of 1 column and 4 rows. 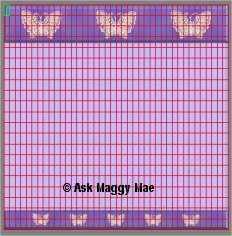 The top butterfly consists of 12 columns and 4 rows. For the center all I need to do is take 1 left side piece, 1 center piece, 1 left side piece. 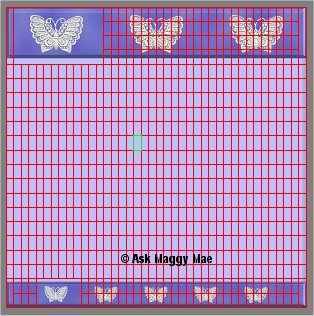 Then for the bottom the left and right sides consist of 1 column and two rows, and the butterfly consists of 6 columns and two rows. Once I set up what I wanted for my template I clicked on the save button and it saved an html page along with a graphic for each square seen in the above picture, as sample of what was saved is shown below.